We're now fully into fall, with the first of the year's major Oscar contenders arriving in theaters. There's a big, shlocky effects film to get out of the way first, though. That film is The Covenant, the male answer to The Craft that we've all been waiting for so eagerly, or at least that's the theory. Directed by Renny Harlin, it revolves around a band of four young men blessed with supernatural powers. Naturally, they use them to get chicks in their backwater town. Their world is upset by the arrival of another warlock with greater power, but like everyone with nearly limitless power, he'd trade it all for a little more. These four present a target of opportunity, then, and a battle to protect the world from evil begins, as they band together to form (cue spooky Goth music) ... a covenant. With an almost completely anonymous cast (arguably the best credit among the leads is Snakes on a Plane), the film is banking on its effects work to carry the day, which may be the entire reason for The Covenant's existence. A money shot of a car disassembling and reassembling is beyond a shadow of a doubt the biggest selling point of the film. Stylistically, this feels like a movie that has been languishing in a vault for about ten years, even down to the choice of music for the trailer (by Linkin Park forebears Stabbing Westward). It looks to be a great ugly mess of a film, and was not screened for critics, lending more credit to that theory. However, the effects seem to be impressing and the GQ models that populate it should bring in young audiences. Opening in 2,681 theaters, it should take the weekend with around $15 million. Hollywoodland is first out of the gate in the "shocking unsolved Los Angeles crime film" genre, beating The Black Dahlia by one week. Directed by veteran TV director Allen Coulter, this film delves into the circumstances around the death of George Reeves, the first actor to portray Superman on TV. Officially, he went upstairs at a party and shot himself in 1959, but Hollywoodland posits a more sinister plot: that he was perhaps murdered by a jealous studio head. 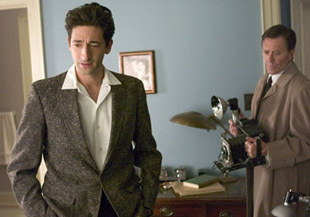 Ben Affleck plays the washed-up Reeves (a role that may or may not hit close to home for him), with Adrien Brody as a detective called in to investigate the possibility of his murder, Diane Lane as Reeves' mistress and Bob Hoskins as her media mogul husband. Hollywoodland is a good old-fashioned detective film, hoping to echo Chinatown, though it hasn't quite received the high praise you might expect for a film that's positioning itself for awards, with Affleck and an overly ambitious script taking most of the hits. However, buzz is still towards the positive side. Focus Features is launching this in a medium-sized release of about 1,500 theaters, which should be enough for about an $8 million weekend. The Protector is the third new film of the weekend, and Thai martial artist Tony Jaa's second North American release, after last year's Ong-Bak. That attempt to create a new Jackie Chan was not a resounding success, earning just $4.5 million in its total run, though it premiered on just 387 screens. The Protector is being taken to over 1,500 screens, with a heavier promotion based on its star and his "all-real stunts" selling point. The Weinstein Co. is throwing its weight behind this one, though they are a studio that's still having trouble establishing themselves. There's a group of die-hard martial arts fans that will flock to this one, but Jaa isn't a big name as of yet. This is a Thai-produced film, and it may take an American-produced one to make him a star. Give The Protector about $4 million. Invincible had an impressive Labor Day Weekend, dropping less than 30% to stay at the top spot for a second straight weekend and $15.5 million over the holiday period. Mark Wahlberg's football drama obviously capitalized on football fever. The actual start of football season might put a damper on its chances, with most of its audience already busy on Sunday. Give this another $7 million this weekend, which should push it close to the $50 million mark.